I’ve got a great giveaway today. Valentine’s Day is the perfect time to spread a little love and we want to help you do it! We thought it would be fun to give one lucky winner $600 – $300 for yourself and $300 to share the love with others. How fun does that sound? I think it sounds AWESOME!! I so wish I could enter myself. How great would it be to win money for yourself and help others at the same time? 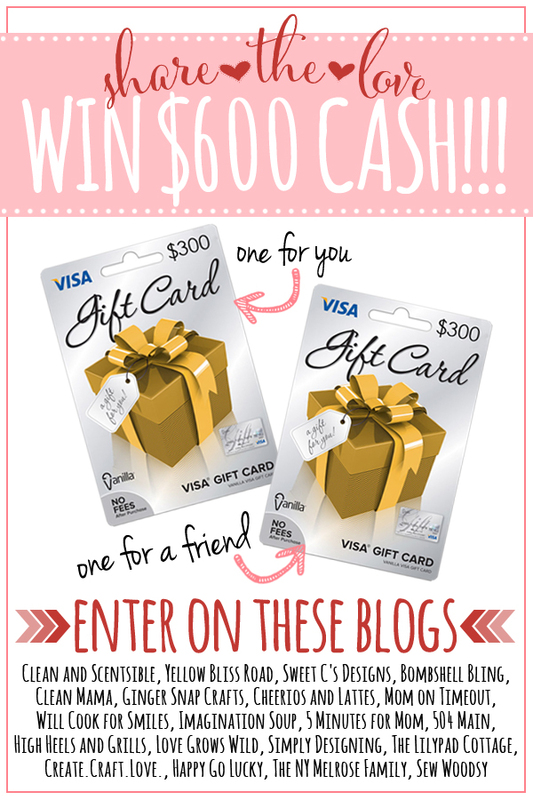 One lucky winner will receive $600 in Visa gift cards – $300 for the winner and $300 to share with others! Use it for random acts of kindness, donations to your favorite charities, for friends or family that need some extra love, or any other way that you choose to spread a little happiness. And then, of course, you get to treat yourself!!! We hope that this will bring you some Valentine’s Day joy and allow you to pay it forward as well! To enter, just follow the Rafflecopter prompts below. I would love to have extra money for random acts of kindness <3 Maybe a good size tip for a waitress or just brighten someones day you see in the street. I would donate to my daughter’s school. I would spread the love by giving my husband guilt-free spending money – he’s the sole money-maker and I keep us on a strict budget, it would be nice to give him permission to spend (w/o hiding it from me!). Just an FYI, the Will Cook for Smiles Pinterest link goes to Simply Designing 🙁 maybe someone can fix that for her! Kristin recently posted…New goal and exciting news! It would hard to share the love, but I would have to spend it on my family! DeDe@DesignedDecor recently posted…~Black Bean Corn Salsa! I would share with my friend who is a widow with 6 kids. I would share the love by gifting one of the cards to my brothers who are going on an upcoming trip to SC! It would help them alot! I’d use mine towards a new pair of much needed, eyeglasses..thanks for the chance! Hi Kara. What a great idea to have a giveaway for Valentine’s Day! Thank you so much and hope you have a fantastic week! So many possibilities, maybe a huge grocery shopping trip. Pick me, pick me! I would give it to my local animal shelter. I’d give the extra card to my neighbor who’s having a bit of a hard time right now. I would give it to my Secret Pal! What a great surprise that would be for her!!! I’d give the other gift card to a friend. I’d give it to a friend whose husband is out of work. Or buy some thing and give them to several people in need. Lots of possibilities. I would give it to my sister who is looking for a job! There are so many possibilities, but I would have to say I would help with paying off debt. It’s hard to get out from under debt, and is such a huge relief when it’s finished. I would love to win so I could let my wife get some new clothes! Thanks for the chance! So many different things but my sister has gone through a rough time and she could use the extra help. Thank you gor this giveaway. My husband and I hadn’t gone out alone due for money. It’d be awesome to win this so we can go out and alone.. no kids on valentines day. I think this is a wonderful idea for a giveaway ! I would spread the love by giving the other gift card to my Mother who is on a very fixed income and could greatly use some extra money. Good luck to us all. I would use for our new house. I would spread the love by sharing the gift cards with my nieces and nephew who need it for school!